Hannah Arendt-Reiner Schurmann Memorial Symposium "Feminism, Capitalism and Social Transformation." 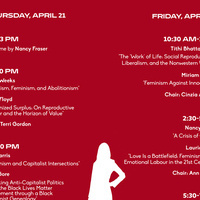 This year’s Arendt-Schurmann Memorial Symposium explores the theme of "Feminism, Capitalism and Social Transformation." It convenes a diverse group of thinkers who are currently engaged in developing a feminist/anti-capitalist perspective for the coming period. Scholars, students, activists, and anyone interested in the feminist critique of capitalism are welcome. The symposium will be held on April 21–22, 2016 (Thursday and Friday) in the Wolff Conference Room at the New School for Social Research (NSSR) in New York City. Organized by the NSSR Philosophy Department, with generous assistance from the Politics Department, Graduate Certificate in Gender and Sexuality Studies, and the Heilbroner Center for Capitalism Studies. Chair: Terri Gordon, Director of The New School's Gender Program. Chair: Cinzia Arruzza, Assistant Professor of Philosophy, NSSR. Nancy Fraser – "Crisis of Care? On the Social Contradictions of Financialized Capitalism"
Chair: Ann Snitow, Associate Professor of Literature, Eugene Lang College. Sponsored by the Department of Philosophy at The New School for Social Research.